SafePark is a leading authority in playground safety; providing initial audits, periodic inspections, maintenance and repair. SafePark understands that there are no safe playgrounds, only safer playgrounds. SafePark can help reduce the chance of an incident and help limit liability and potential litigation. SafePark provides easy to understand reports for safety audits, periodic inspections, safety surfacing impact attenuation testing, ADA and preventative maintenance programs. Playground injuries are the leading cause of injury to children in childcare and to children ages 5-14 in schools. In 2003 more 208,100 children 12 and under were treated in hospital emergency rooms at an estimated annual cost of $6.8 billion. It is estimated that one third of playground equipment related deaths and 75% of playground equipment related injuries occur on public playgrounds. Approximately 70% of playground equipment related injuries are caused by falls to the surfacing. The majority of these injuries take place on public playgrounds, including schools, childcare and park playgrounds. These statistics speak volumes regarding the need for SafePark Services. SafePark concept has a process to facilitate the systems that most efficiently deliver these services to local HOAs and municipalities. The business model has been essentially perfected over the years and is in a growing market that requires the capability and bandwidth of new partners that can offer the same suite of services in different regions of the country. The growth of this market segment is driven by new and more stringent safety standards. These regulations are the standard of care that all public playgrounds are held to and the owners are responsible to uphold. When you join the SafePark team you have the choice of a new start-up business or you can convert your current playground safety company to be under the SafePark umbrella. When you join the SafePark team you will be given an exclusive territory of ideally, 500,000-1,000,000 in population to develop. SafePark is always looking for expansion opportunities in new markets! The fee for one franchise is $25,000. 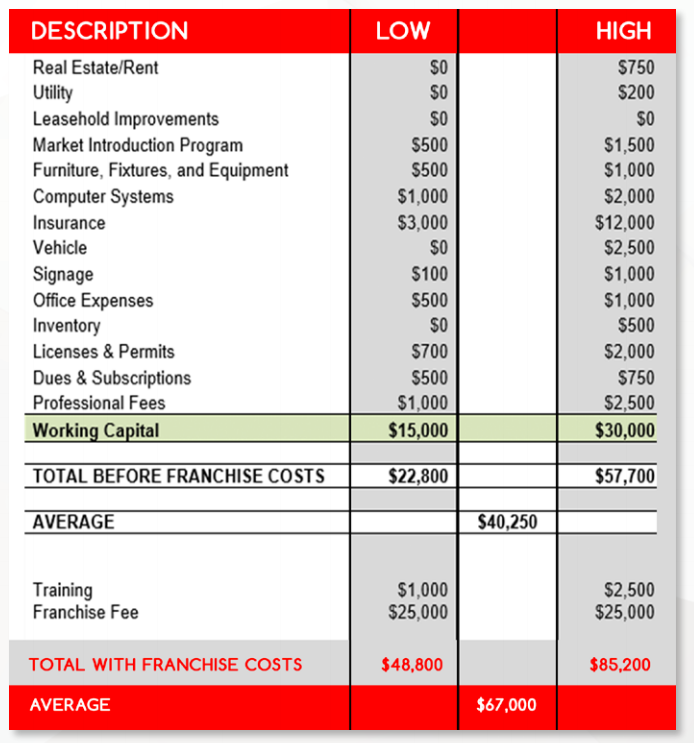 Minimal start-up costs can be as low as $48,800 depending upon a number of factors. Please see the chart below. Step 6: Join the SafePark Team!